When playing No Limit Texas Hold’em, you have the ability to change your bet sizing whenever you want. You can bet larger when you have a good hand and smaller with a bad hand; This is known as exploitable poker. On the other hand, if you bet the same amount regardless of your own hand strength; that is known as unexploitable poker. As you move up in limits, knowing when to play exploitable vs unexploitable is a very important and profitable skill to learn. It is more profitable to play exploitable when your opponent doesn’t notice. This means that your opponent isn’t worried about pot odds or anything other than the strength of their own hand. 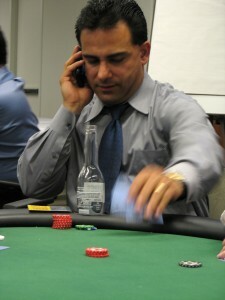 Players will tend to make up their minds on whether they are calling with draws or not regardless of pot odds. This is very profitable because you can then take advantage of that by betting larger when you think they are on a draw to maximize your value against the draw missing. Being able to play exploitable poker is also very nice when making continuation bets. If your opponent is the type to go all the way or fold right away then you can save money by betting less when making a continuation bet. If they are going to fold regardless the size of the pot, then you should make it cost yourself less for the times that they do decide to call you. A good way to target players you can play exploitable against watch how they play draws. If they call down with a draw regardless of pot odds being wrong to call then they are probably not paying too much attention to the size of your bet. Another good way to target these players is to simply put them to the test. Try playing exploitable against them and if it seems they are picking up on it then change back. As you move up in limits it becomes more important to play unexploitable. There will be stronger players at the higher limits whom will be trying to spot patterns in your play. They will be able to make the association with your bet sizing and hand strength. Playing exploitable has short term benefits, but can lose you a lot of money if you don’t realize when someone has picked up on your betting pattern. We can counter this situation by playing something called unexploitable poker. Your bet sizing should be a similar size in comparison to the pot every time. You don’t have to bet exactly 75% pot every time, but try to keep your average close. By playing unexploitable, we shut off the information that we are allowing our opponents to gather. We lose some possible expected value in the short term, but we are looking to make up for it by not letting ourselves get set up on a big hand. Playing unexploitable means you give up the ability to alter your bet sizing. This may slightly decrease your win rate in the short term, but it can save you more money in the long run by not giving off any tells. If you were unaware that a strong player had a bet sizing tell on you, they could take advantage of you and win many more pots than they should. The risk of this happening drops to zero if you play it safe and use constant bet sizes though. This brings us to the conclusion. It is possible to play a profitable style with either exploitable or unexploitable poker, but the best players will mix them both together. You can bet differing amounts against each opponent depending on their perceived skill level. This will allow you to play exploitable against the weak fishy players in an effort to win more with your good hands and lose less with your bad hands. Against strong players, with hand reading skills, you can switch to playing unexploitable to disguise information about your hand. It is, however, possible to use unexploitable poker against the strong players as well. You should keep your preflop and continuation bets pretty similar, but you still play exploitable on the turn and river. Let’s take for example playing a flush or straight draw against a competent regular. Even though you might play all your bigger draws the same way on the flop and turn, it is uncommon to get to a river and showdown against the same opponent multiple times. This means it will be very difficult for them to pick up your exploitable betting river betting patterns until you have played thousands of hands with the same person. At this point, you can change your river betting strategy against that person to counteract their information. Some poker sites, but not all, will even allow you to change your username, which would totally negate all of the information your opponents have gathered against you so far. I have made at least two videos that discuss ways to profitably play exploitable poker. The first is during Trikkur 4 when I discuss continuation bets. During a wide range of board textures you can bet different amounts because your opponent will always react the same to any bet. Trikkur 13 discusses bet sizing and the different variables that go into it. One of these important variables is whether or not you should be playing exploitable or unexploitable versus that opponent. There is also a really great article on continuation bet sizing that reviews seven different methods to change your c-bet sizing. These are all great examples of playing exploitable or unexploitable that you can start to actively use during your next poker game.